December 13, 2018 10:31 pm. 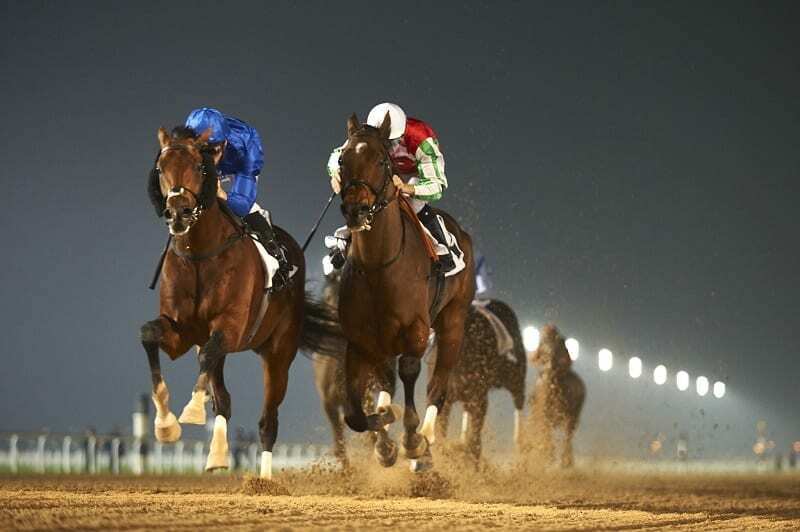 Thursday’s final Al Ain meeting of 2018 is a seven-race card with the traditional six contests for Purebred Arabians and just the one for Thoroughbreds. The last mentioned is a very competitive 2000m handicap that has attracted the maximum allowed field of 15, as well as four reserves waiting in the wings. Champion trainer Doug Watson saddles three with stable jockey Pat Dobbs opting to partner Ballad Singer, who posted his sole career victory in a 2000m Sharjah handicap last November under the same jockey. He was third on his only start to date this season, in the equivalent Sharjah handicap to the one he landed last year, but he has somewhat disappointed on his two previous Al Ain outings. Ballad Singer is owned by Mohd Khalifa Al Basti, as is stable companion Igloo, the mount of Sam Hitchcott. He too has one success on his resume, which came in a 1400m Jebel Ali maiden 54 weeks ago when Dobbs was in the saddle. The EERC (Emirates Entertainment Racing Club) owns Watson’s third runner, Skyrider, who has the assistance of George Buckell on what will be his third start of the season but first ever at Al Ain. A promising fourth on his racecourse debut, as a 2-year-old at Meydan last November, he has not built on that but is another racing for the first time at Al Ain. Seeking a first winner of the season, Beverley Deutrom has only saddled 12 runners so far during the campaign, but has two in this, including course winner Parklife, victorious in a handicap over 1800m just over a year ago. That was the first occasion he was ridden by apprentice Adam McLean, who has partnered him in all five subsequent starts and is in the saddle again. Entitled to have needed his Meydan return last week, over 2200m, he has to be considered with Al Ain known to suit him whereas stable companion, Ticket Holder, has yet to race there. His initial start for Deutrom was a winning one, in a 1200m Meydan maiden in early November 2017 but that remains his sole victory though his first run of this season was a good second, over 1600m, at Meydan. He has been well beaten twice since though and with McLean seemingly opting for Parklife, Pat Cosgrave rides. When Parklife was victorious last year he was chased home by Mears, one of three in the race for Ali Rashid Al Rayhi and the choice of Fernando Jara. That was his only visit to Al Ain with his one career success achieved in a 1900m maiden at Meydan in January. He is joined by stable companions Secret Trade and Cross Step, the mounts of Royston Ffrench and Olivier Doleuze respectively. Of the pair, the former is an Al Ain winner having landed a handicap over the same 2000m as Thursday’s race in February 2017. In what does appear a truly wide open contest, Richard Mullen rides Press Room for his main employer, Satish Seemar. Twice a Meydan winner in 2015, he has dropped a long way in the ratings since and has finished third at Meydan, and second at Sharjah on his two outings this season. For Musabbeh Al Mheiri, Ben Curtis rides Jintshi, a course and distance winner for Seemar and Mullen in January. Owned by Al Bait Mutawahed Team, he will be having his third start since changing yards having twice failed to land a blow at Jebel Ali. Having landed his 100th career success at his local track last week, Helal Al Alawi, based at The National Stables in Al Ain, will be hoping to build on that tally. He and Billy Lee combine with Leicestershire, having just his fifth career start and second this season. However, on that one outing in the new campaign, he was behind Press Room and Ballad Singer at Sharjah so would seemingly need to improve to land this. The best of the Purebred Arabian action is also a 2000m handicap in which a select field of seven have been declared with the weights headed by Ghazayel who does appear the class act in the race. Raced nine times, this 4-year-old filly has five victories to her credit and has been defeated just once in three UAE outings having won twice on the Abu Dhabi turf. She has three dirt victories in Muscat to her credit and with apprentice Saif Al Balushi claiming a valuable 2.5kgs she could be hard to beat for Younis Al Kalbani. Should she disappoint, Eric Lemartinel could take advantage and saddles three for His Highness Sheikh Khalifa bin Zayed Al Nahyan with Cosgrave choosing to partner Mukaram, successful in half of his eight career outings to date. Cosgrave’s mount has actually registered all four of those victories on dirt; three at Al Ain and an historic first Jebel Ali success for the trainer late last December. Mullen rides Saarah for the always respected Jean de Roualle with His Highness Sheikh Hamdan bin Rashid Al Maktoum also represented. His blue and white silks will be carried by Curtis aboard Ashraaf for Al Mheiri.